Is The Biotech Sector Bottoming Out? The Biotech sector is one of the most dynamic ones in the stock market. It has shown its potential and resilience over the last couple of economic cycles. Since the bear market lows in 2008 during the Great Recession, the Nasdaq Biotechnology Index as represented by the ETF symbol IBB, surged over 600% to its peak in July 2015, compared to a rise of over 300% for Nasdaq, and 220% for S&P 500. Even looking at a different time frame, the results are similar. 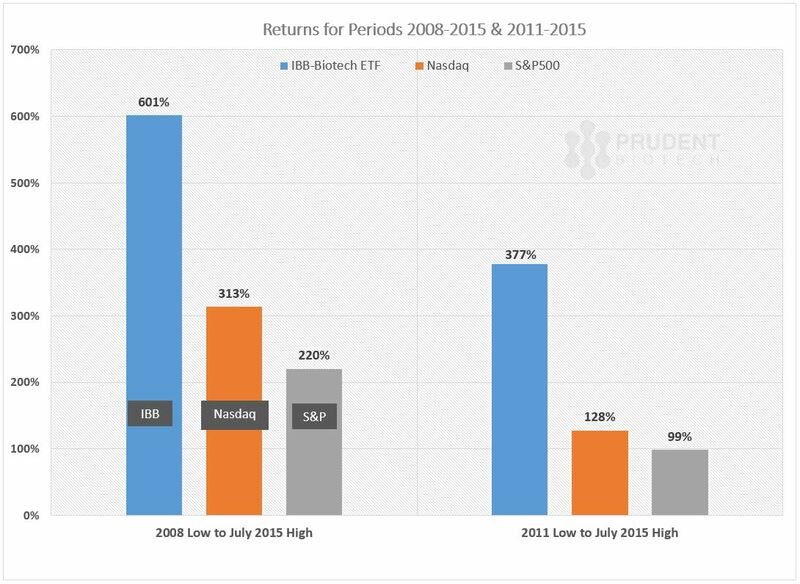 Since the last significant market correction in 2011 to its high in 2015, the Biotechnology IBB catapulted over 375% compared to Nasdaq’s rise of 125+%, and S&P 500’s 99% return. The Biotech performance has been rewarding even on a risk-adjusted basis, as we had discussed in an earlier article. The stock market has been struggling since July 2015, its decline principally triggered by the resetting of expectations around interest rate policy, the slowdown in the Chinese economy, and the pricing collapse in the commodities markets. The resulting flight from risk and the consequent market multiple contraction have affected the highly sensitive speculative sectors of the market harder, as evidenced by the performances of the biotech index, declining over 35%, and the small cap Russell 2000, declining over 25%, compared to the performance of the Nasdaq and S&P 500, both of which declined between 15 and 20%. We believe the Biotech sector has seen the worst of its decline, considering the economic environment we find ourselves in today. 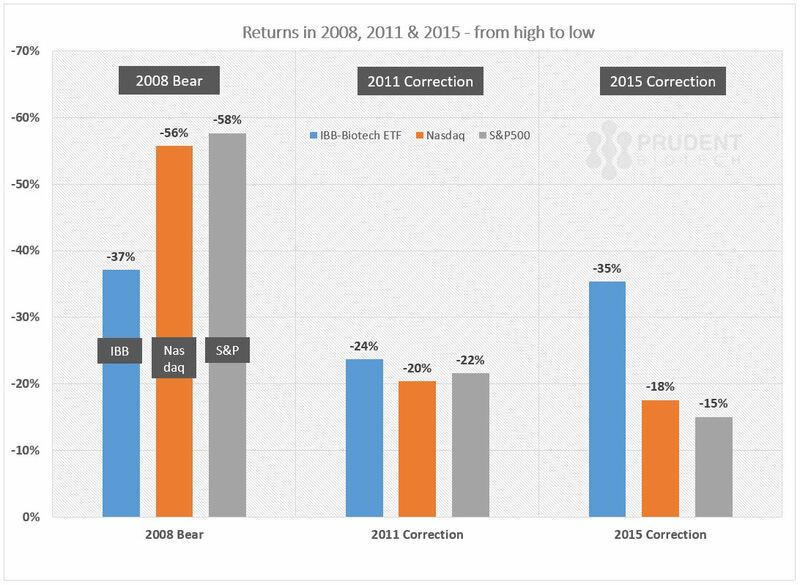 During the last bear market in 2009, one of the most vicious economic periods since the Great Depression, the Biotech sector corrected 38% from its peak. In the 2011 correction, the sector pulled-back 24%. Compared to both the previous corrections, the Biotech sector has corrected 35% at its lowest point. The above data provides a contextual framework to understand the current situation. After all, if the theatre is beginning to burn, then it will be helpful to know how far to run. Today, the economy is in a much better shape and there is no extreme risk-aversion sentiment, as was evidenced in 2008 due to the near-collapse of the global financial system. During the last correction in 2011, the market was buffeted by the Eurozone crisis. This time we have a commodities meltdown, a slowing Chinese economy, and a change in interest rate policy. The weak commodities market is affected by a combination of oversupply in oil and weakening demand from China. All these 2015 events taken together do not even come close to the dire state of affairs in 2008 and in 2011. Biotechnology stocks or Biotechs, which have to rely on public markets for raising funds as opposed to debt markets, are much better capitalized to fund their research and studies, compared to the 2008 period. Observing the magnitude of pullbacks in the past suggests that we may have seen the worst of the decline in the Biotech sector. It is our belief that the Biotech sector is bottoming-out. There may be some pullbacks as part of a retesting of lows and additional consolidation around the 250 level on the IBB index. But the correction in Biotech is most likely coming to an end. The risk to our hypothesis here is obviously an economic meltdown. What kills a bull markets is typically the expectation of an economic recession. Rising rates don’t kill bull markets, unless they nudge the economy towards a recession. If anything, the present environment with its volatility, skittishness, strengthening dollar, and global economic and political issues, has pushed out any conversation of the next rate hike to June or later, as was highlighted in the market outlook article here. The mild GDP report for fourth quarter of 2015 would further strengthen this viewpoint. If the economy does indeed enter into a period of slowing and contracting economic growth, a big risk to consider will be the ability of the Federal Reserve to rekindle growth this time, since interest rates are already near-zero to begin with. In such a situation, we envision a monetary policy that would need to be supported with fiscal policies this time to rekindle and sustain economic growth. But we are definitely not there yet. 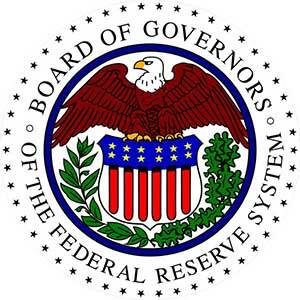 It has been our belief that the biggest risk, following the first rate increase, was a systemic one – pockets of unidentified risk embedded in the global financial system that bubble up as a result of a resetting of the interest rate structure. We believe the probability of such a risk being imminent has diminished, as global markets, including currency markets, have readjusted with volatility. 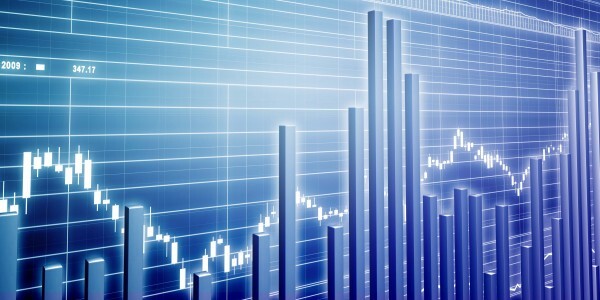 In addition, the realignment of investments, following an exceptional period of zero interest rate policy which was critical but distorted the traditional risk-reward framework, will continue to have an impact on the stock market in terms of a shift of assets away from stocks and into non-stock related investments. These risks were cited and discussed in an earlier article last year, and related articles can be viewed on the blog. The stock market is presently in a risk-sensitive zone, and volatility can further erupt triggered by headline events, which may not have any meaningful impact on the economy. Even though we anticipate the ongoing correction in biotech to be approaching its end, and we have remained in Cash in our model portfolio this year, it does not mean a straight rise up for the sector. But what it does mean is the time is right to freshen up the Biotech list of attractive names from small caps to large caps. We believe small cap names like Dynavax Technologies (DVAX), Eagle Pharmaceuticals (EGRX), Heron Therapeutics (HRTX), Inotek Pharmaceuticals (ITEK), Prothena (PRTA), TG Therapeutics (TGTX), and Trevena (TRVN), while SMID names like Neurocrine Biosciences (NBIX), Kite Pharmaceuticals (KITE), Intrexon (XON), and Portola Pharmaceuticals (PTLA) are a few examples of companies that can potentially be attractive opportunities. In addition, a few large cap biotechs like Amgen (AMGN), Gilead Sciences (GILD), Incyte (INCY), Regeneron (REGN), and Vertex Pharmaceuticals (VRTX) have come under intense pressure recently, but can present attractive opportunities as the market consolidates. Biotech is a high-risk, high-reward sector, and investors should understand the risks before investing. We can change our opinion if market conditions warrant.